I have always had a feeling for dragons, since I was a child--and judging from the many "coincidences" that occur concerning these mythical/mystical beasts perhaps it is mutual. 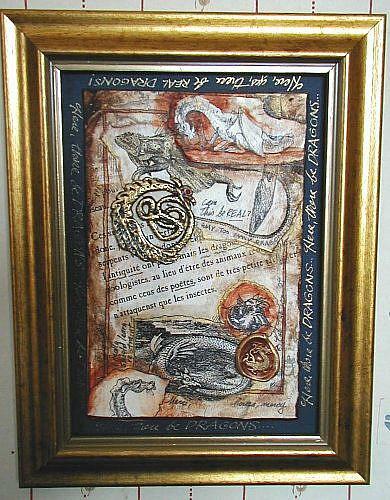 This one combines dragons both real and imaginary, ancient and new, from alchemical texts to 18th-century French natural history books to my own drawings and constructions. A seal of the sort once used to seal ancient documents bears a dragon stamp...there are stories within stories here, and literary references as well. 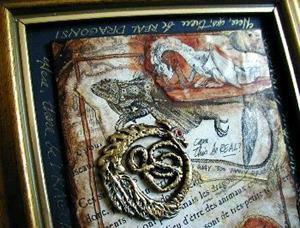 One dragon appeared in a book on alchemy by Mircea Eliade--beneath that image is lettered "Merci, Mircea--mercy! ".